Relive the excitement of the AMTA 2017 National Convention! Opening Session keynote speaker Shaun T, a world renowned fitness expert, energized AMTA 2017 National Convention attendees with his message of self-care. He got the massage therapist audience on their feet with an interactive choreographed dance routine, and positive messages on health and wellness for massage therapy professionals. AMTA President Dolly Wallace shared her personal story of how she started her massage therapy career and announced national award recipients. President Wallace also announced that AMTA will provide a minimum of $475,000 to the Massage Therapy Foundation this year. 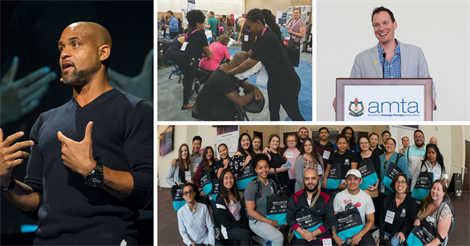 AMTA’s support helps MTF carry out its mission to advance the knowledge and practice of massage therapy by supporting scientific research, education and community service. Closing Session speaker Shawn Achor, a top TED speaker and a former Harvard professor, shared research on the correlation between happiness and success. Using humor and his scientific approach to emotional self-care, massage therapists learned actionable techniques to increase happiness in their personal and professional lives. In AMTA’s Opening Session & Business Meeting, Executive Director Bill Brown spoke strongly of AMTA as the nonprofit advantage in the profession. And, he announced that the association is working to protect massage therapists’ right to continue to use the term “trigger point” freely and without restriction. The American Massage Therapy Association (AMTA) is the only national association in the profession defending the right of massage therapists everywhere to continue to use the term “trigger point” without restriction, by contesting an attempt by a company to trademark the term. AMTA believes educating and creating a better understanding between all employers and massage therapists will result in better work options for massage therapists. AMTA is committed to working with all employers to strengthen workplace options for the massage therapy profession, including Massage Envy, the nation’s largest employer of massage therapists. Starting October 1, self-care continuing education courses will be available on AMTA’s website for FREE to all massage therapists. The self-care and injury prevention program is created to Occupational Safety and Health Administration standards (OSHA is the federal government agency that oversees workplace safety). View photos from the AMTA 2017 National Convention, including pictures from the red carpet, Exhibit Hall Photos with Shaun T and more! Download speaker handouts from the AMTA 2017 National Convention, as well as Show Dailies. The Largest Event in the Massage Therapy Profession! 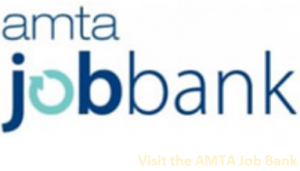 Attend the AMTA 2018 National Convention, August 9-11 in Washington, DC! Join the massage therapy profession for continuing education, networking and products to help you succeed. Check back this spring for additional AMTA 2018 National Convention details!